Crib-attaching infant soother that captivates baby with mesmerizing soothing lights, classical music and water effects that fade on and off. More info here. I invested in this for my first born and now my youngest loves it as well! I love that there are many different music options so your baby doesn’t have to always listen the the same thing. 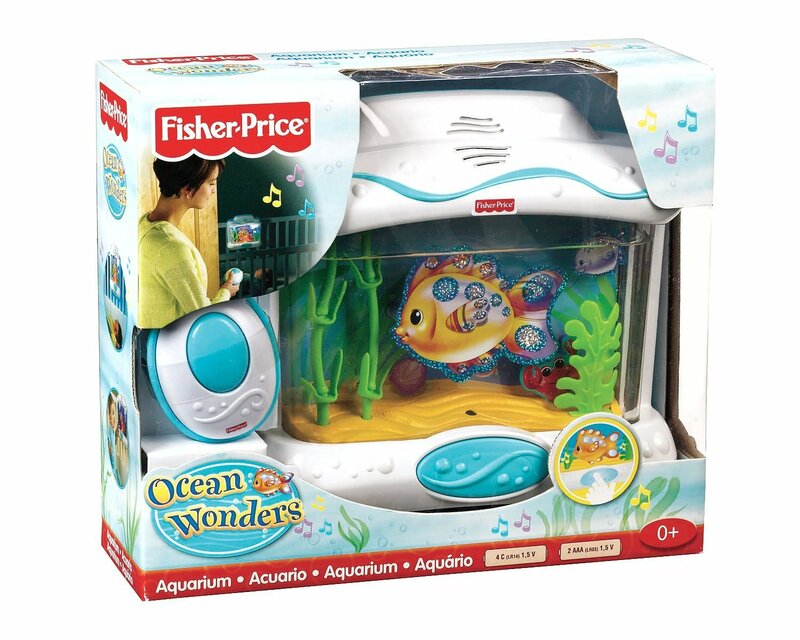 You can pick from a number of different songs, water sounds, bubbles or a shuffle option where it plays through all the music. You can have motion from the fish (with bubbles), just light, or no light at all with just sound. 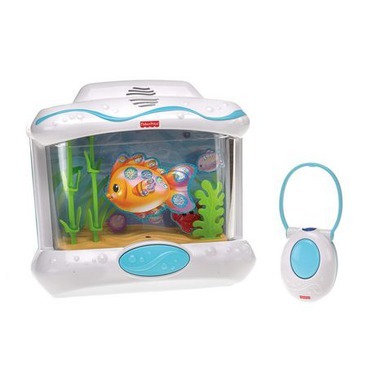 This has a great variety for your baby and the added remote makes it easy to just turn it back on without going into the room when you need that option. 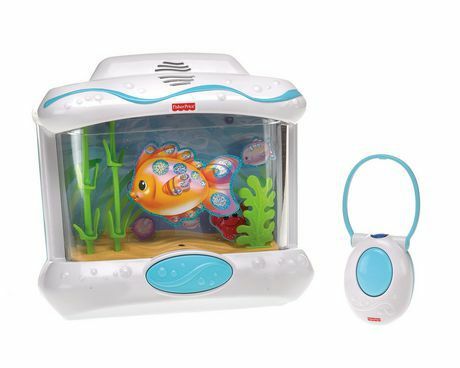 I had one of these aquariums for both of my children as babies, and they both adored it. The music is soft enough to fall asleep to, and I love the option to use the lights or not. All in all I think it is a great investment for babies and toddlers. Don't get me wrong it was a great product and reasonably priced, however it kept my son up and it did not calm him or put him to sleep. It was more of a stimulator and got him super excited. As soon as he heard it or saw the lights he was drawn to it, and fought his sleep. My babies have loved this. It gives them something to occupy their attention long enough to calm down before bed, for naps, or just so I can quickly do something without them being upset (sometimes; I mean let’s be realistic here nothing works every time). 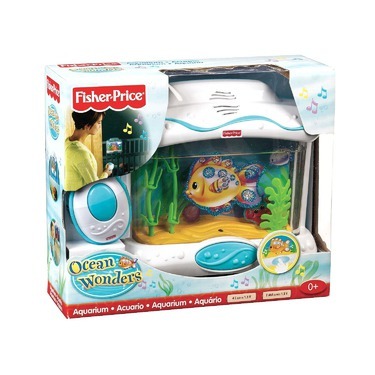 My baby absolutely loves this aquarium...He stares at it for a long time ..it plays music and the fish and plants move ..has a soft blue glow ..The remote is awesome as you can just keep replaying it without baby seeing you..
Our son loves this thing!! 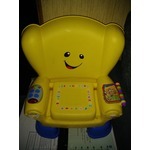 We used this until my son was old enough to stand in his crib. The only reason why we removed it was because when he was bored falling asleep he would kick it (turning it on and off) and all we could hear was banging. 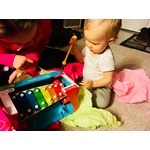 He loved it when he was small and it was part of our nighttime routine. I recieved this for a baby shower gift. Once we moved my daughter into her crib we set this up and it was a miracle. Our daughter loved it. 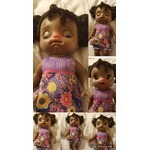 If she would wake in the night she would reach up press the button and back to sleep she went!!! Cant wait until my son is in his crib and hope it works as well. I like that it comes with a remote so you can turn it on or off without having to come fully into the room, especially if baby is already asleep. It is kind of heavy though and it’s hard to find a proper placement in a crib where baby doesn’t bump into it when rolling around or sitting up.